Something savoury for a change, this is nice and fresh and light. You can make up a batch of the little tart crusts and keep them in an airtight container for when you need them.. they are fairly quick and easy to make and taste great. I am also going to make up some other savoury fillings for the one I have left over. Ground buckies and almond to a food processor and blend until fine then add remaining ingredients minus the olive oil and blend to combine all ingredients together then slowly add olive oil down the shute until it sticks together when pressed into a ball. Then press into a pie shell or a cling wrap lined muffin tin for small tartlets and place in the fridgte for about an hour. Remove from tin and place onto dehydrator trays and dehydrate for 24hrs. Let cool and fill or store in an airtight container in a cool dry place until ready to use. Fresh Basil or coriander -,I used coriander as I didn't have any basil! Combine all ingredients in a bowl with just enough vinegar so it's not to wet as this will make the crusts go soggy. 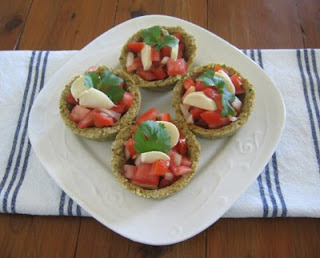 Spoon into crusts and top with bocconcini or slice of avocado, decorate with coriander or basil. A sprinkle of pepper would also be nice as well as fresh chilli if you like a bit of heat.